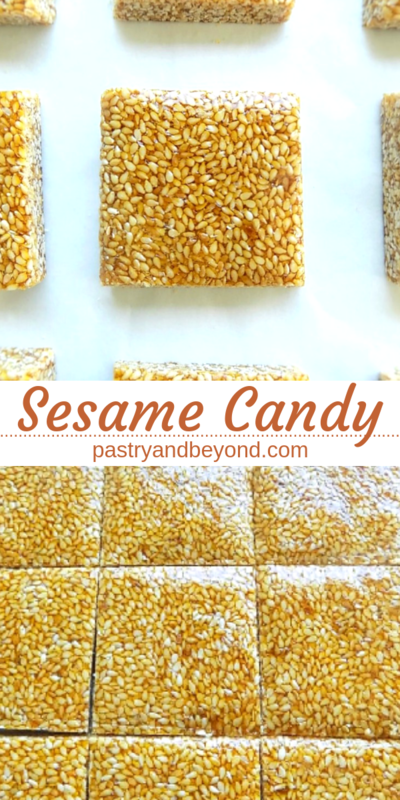 You can easily make this crunchy and delicious sesame candy with 2 ingredients! Today’s post takes me back to my childhood. 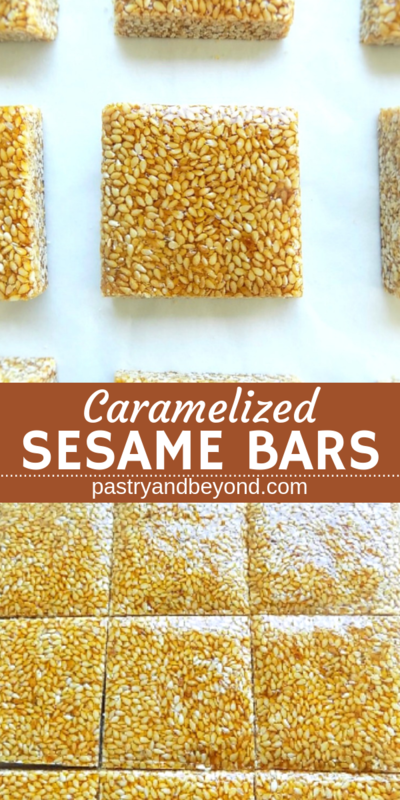 I remember the days when my mother came home with caramelized sesame bars. Actually, I don’t exactly know why, but it was making me happy all the time. I have an idea though, probably “caramelized part” was the reason. 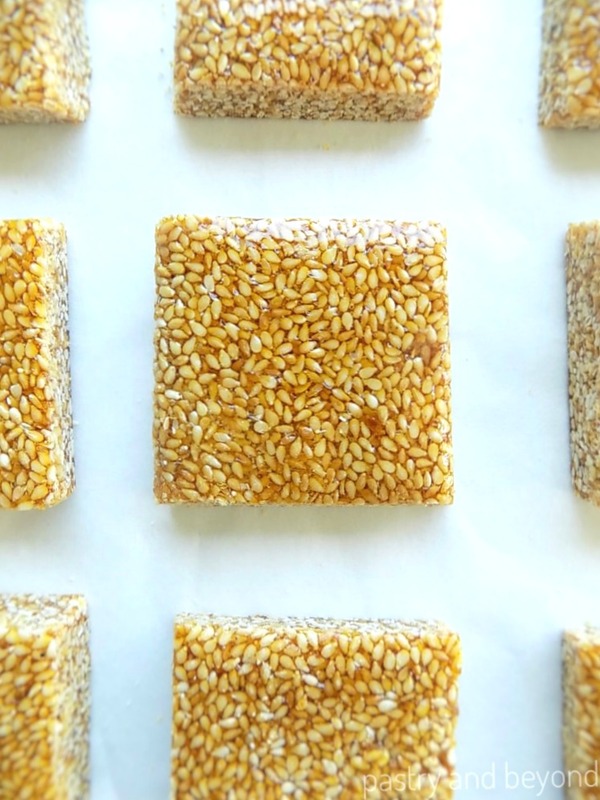 It is a mixture of 2 ingredients; toasted sesame seeds and caramelized sugar. Actually, this recipe is familiar to you from my caramelized almonds. First, you melt the sugar, and then add almost the same amount of toasted sesame seeds into the melted sugar and mix them. Then you need to level the caramelized sesame seeds with a rolling pin and cut them into pieces. First I toast the sesame seeds in a pan by stirring frequently at low heat for almost 6-8 minutes until they are golden brown and give off their fragrance. I immediately remove it from the heat as they can pop and jump out of the pan like popcorns. So I am careful when I toast them on the stove. Besides, they can easily burn with the heat of the pan. 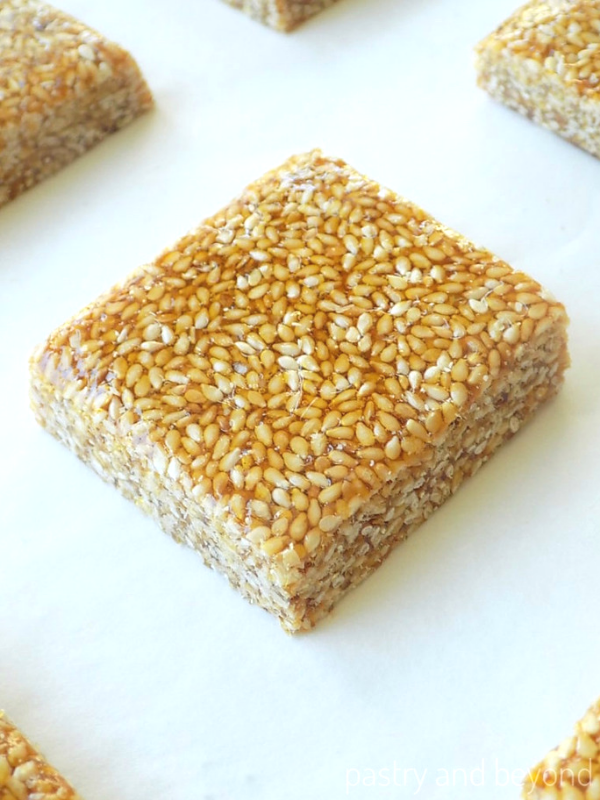 Alternatively, you can toast the sesame seeds in the oven by placing them on a baking sheet too. Later, I place sugar in a big pan and let it melt at med-low heat. I don’t stir but swirl the pan to avoid crystallization. When some parts of the sugar melt and become liquid and some parts don’t melt, I use my long heat proof spatula to put the melted sugar on top of unmelted sugar. This step helps melted sugar not to burn but unmelted sugar to melt. Then I swirl the pan again. If there are still some unmelted pieces, I start stirring to combine the unmelted pieces with melted sugar and they melt shortly. When the sugar melts and turns to amber color, I immediately remove the pan from the heat and add the toasted sesame seeds and stir. I cover the sesame seeds with melted sugar. Then I place the caramelized sesame seeds on to a baking sheet covered with parchment paper and spread it with a spatula. The mixture is very hot so I don’t touch to the caramelized sesame seeds. I put another parchment paper on top of the caramelized sesame seeds and level it with a rolling pin. While still warm, I use my sharp knife to cut them into pieces. You can cut into rectangles, squares, triangles, as you like. 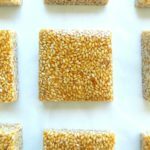 You can easily make sesame candy: caramelize the sugar and add the toasted sesame seeds, then place the mixture on a parchment paper and level! 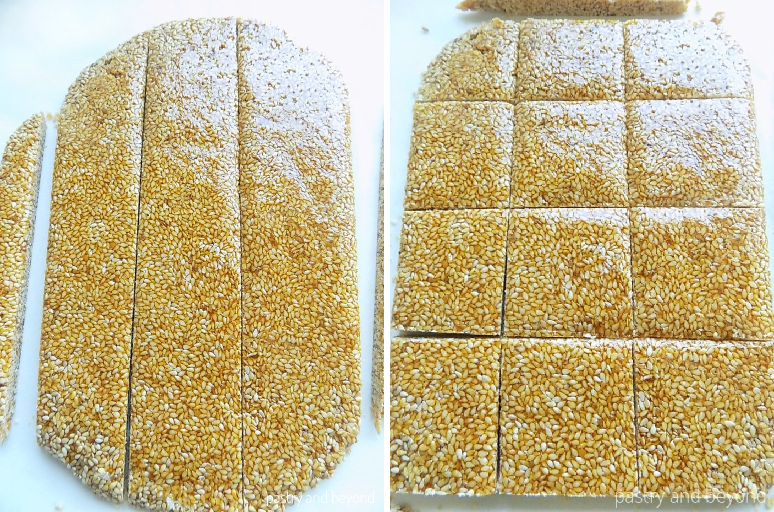 Toast the sesame seeds in a medium pan by stirring at low heat for almost 6-8 minutes. When they are golden brown and give off their fragrance, immediately remove the pan from the heat as they can pop and jump out of the pan like popcorns. They can also easily burn with the heat of the pan. Set aside. Alternatively, you can toast them in the oven by placing them on a baking sheet at 350°F(177°C) until they are golden brown and give off their fragrance. 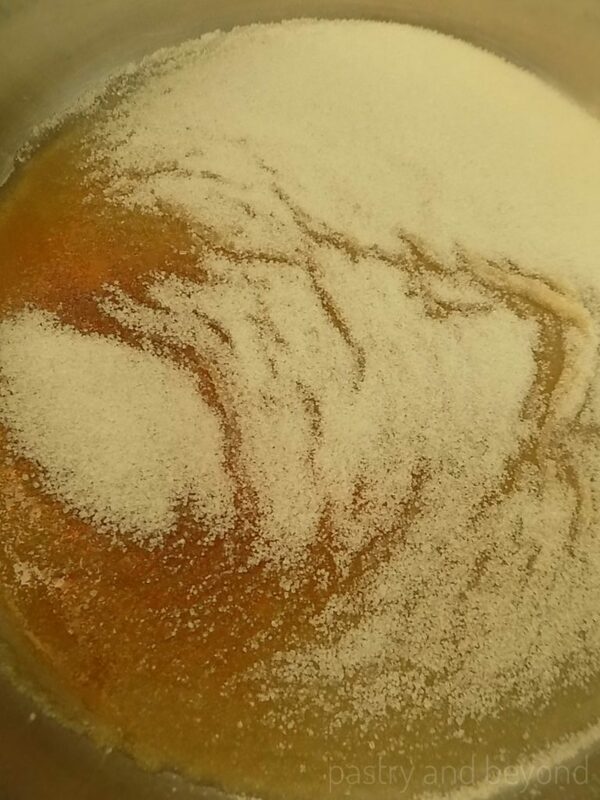 Place the sugar in a big pan and let it melt at med-low heat. Don’t stir but swirl the pan to avoid crystallization. When some parts of the sugar melt and become liquid and some parts don’t melt, use a long heat proof spatula and put the melted sugar on top of unmelted sugar. This step helps melted sugar not to burn but unmelted sugar to melt. Swirl the pan and if there are still some unmelted pieces, start stirring, they will melt shortly. As the sugar melts and turns to amber color, remove the pan from the heat immediately and add the toasted sesame seeds and stir. 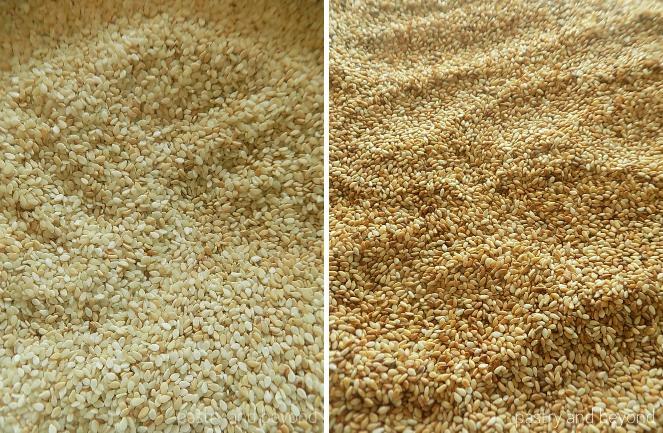 Make sure sesame seeds are mixed with melted sugar evenly. After they all mixed, place the caramelized sesame seeds on to a parchment paper and spread it with a spatula. Be careful as the mixture is very hot. 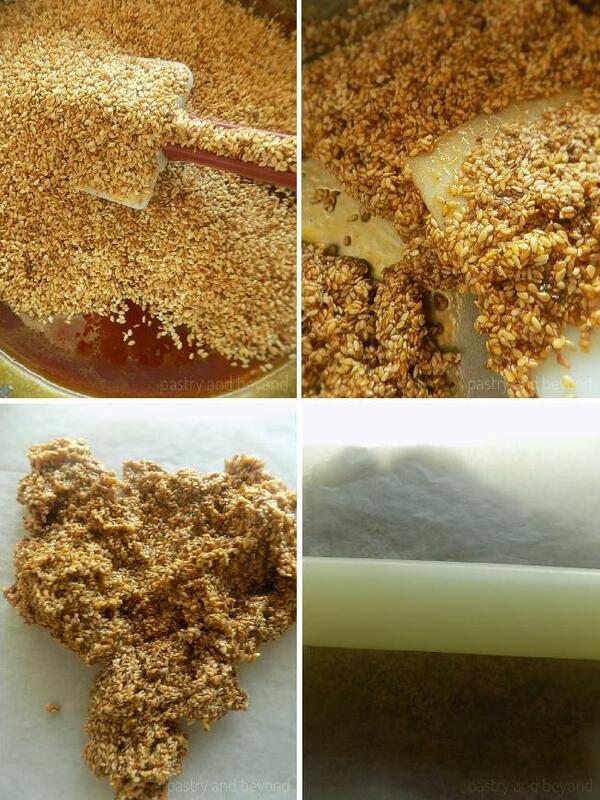 Put another parchment paper on top of the caramelized sesame seeds and level it with a rolling pin. Cut into pieces as you like with a sharp knife while it is still warm. The calorie information above is calculated for small pieces. It is an estimate that is provided by an online nutrition calculator.